We have been looking at the rules for working out Roman Numerals. Can you remember them? Watch the video again and practice the different ways to remember the numbers. 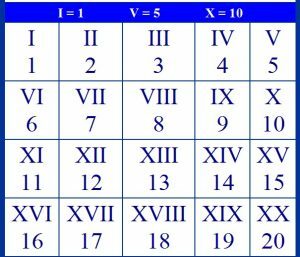 Play the game to practice using Roman Numerals. I finished the game! I got 4/5 of them all first time! I have watched the Roman numerals video again at home and I’ve played the Roman numerals game and I got 5/5 in total the first time I played. I played Kahoot too! I enjoyed the game, I got a few wrong but had fun. I finished the game and got 1 wrong 4 out of 5. I have completed the game! I enjoyed playing it and I can remember the Roman Numerals much better now. IF has the gold.This was fun. I also got 4/5 as well. I’ll try again tomorrow. I enjoyed the game. I enjoyed the game and watched the video. I loved the game!!! I had to think a bit, but I still got 5/5.